Today was a very special day for me. Because today I saw a Purple Emperor for the very first time. Which is pretty special, because I’ve been looking for one of these elusive butterflies since I was about ten years old. As a small boy browsing through my Observer’s Book of British Butterflies, the Purple Emperor and the Camberwell Beauty were the butterflies that dreams were made of. And today – after many years of looking – my dream finally came true! Most often known for its striking red, black and white colour, the underside of teh Red Admiral butterfly is equally beautiful. This morning I went for an early morning walk. 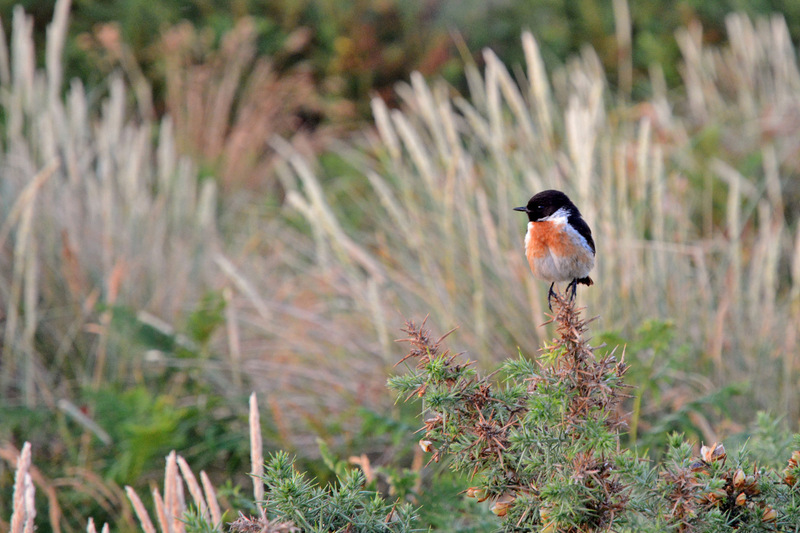 Here’s a photo of a Stonechat who joined me as the sun came up on a new day. I remembered my dear old Dad showing me Stonechats when I was a small boy, describing the rasping ‘chack-chack’ call of the Stonechat like two pebbles being struck against each other. Thank you Mr Stonechat for your company this morning. And rest in peace, Dad. I miss you so much. The House Martin nest is a very busy place today! The parent birds are visiting every five minutes or so which is a sure sign that there are chicks in the nest and that there are plenty of insects available to feed them with.